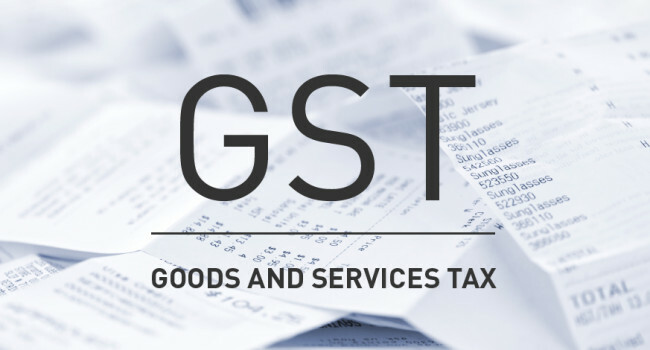 The Goods and Service Tax (GST) is a Value Added Tax (VAT) which will be implemented in India from April 2016. GST refers to “Goods and Services Tax”, and is proposed to be a comprehensive indirect tax levy on manufacture, sale and consumption of goods as well as services at the national level. All indirect taxes levied on goods and services by the Indian Central and State governments will be replaced by GST. It is aimed at being comprehensive for most goods and services and for the economy. The basic principle behind GST is to have a single Taxation System for Goods and Services throughout the country. Currently there are various taxes on Goods and services in the Indian economy such as VAT, Service Tax, Excise, Entertainment Tax, Luxury Tax Etc. Now in the new proposal of GST; the Indian Economy will be having only two taxes on all goods and Services i.e., State Level GST (SGST) and Central Level GST (CGST). In case of the Central GST, various taxes will be included with CGST which, presently are levied separately on goods and services by the Central government. These will include; Central Excise Duty, Additional Excise Duty, The Excise Duty levied under Medicinal and Toiletries Preparation Act, Service Tax, Additional Custom Duty (CVD), Special Additional Duty, Surcharge, Education Cess and Secondary and Higher Secondary education Cess. In case of the State GST also, some taxes will be included with SGST which presently, are separately levied on goods and services by State Governments. These will include, VAT/ Sales Tax, Entertainment Tax (unless it is levied by local bodies), Luxury Tax, Tax on lottery, State Cess and Surcharge to the extent related to supply of goods and services. a. Those taxes which commence with import / manufacture /production of goods or provision of services at one end and the consumption of goods and services on the other end. b. The taxes, levies and fees which are not related to supply of goods & services should not be included under GST. Taxes on items that contain alcohol and petroleum product are kept out of GST. The taxing policies for these products will continue to be as per existing practices. Tobacco products will also be taxed subject to GST. But government has the authority to levy the extra Excise duty over and above GST. The taxpayers whose gross annual turnover is less than 1.5 Crore (small taxpayers) are exempted from CGST and SGST. Each taxpayer will be allowed to have integration of GST with Direct Tax on the basis of PAN based identification number. Exports are fully exempted under GST with Zero rates. The proper implementation of the GST and smooth transition from the prevailing system is a major challenger before the Finance Minister. 1. Rapid increase in Assesses: The tax net will be widened by the dual GST model by taxing every economic supply in the distribution network. This will result in rapid increase in assesses. For this, some of the businesses will have to restructure their distribution network to reduce additional tax burden on the consumer with a view to be price competitive. Although it will generate revenue in a neutral and transparent way but the Government will have to ensure that the ultimate consumer is not burdened with tax beyond his capacity. 2. Place of Supply: Defining the place of supply in respect of certain services and intangible properties will be one of the main challenges in introducing in GST. The place of supply in GST will have to be clearly defined to avoid disputes among states in case of inter-state transactions. The point at which tax would be levied - invoice date, due date or payment date, will be explained by the Time of Supply. The variations of taxes present in the current system such as service tax, excise duty, sales tax etc. will be eliminated in GST. 3. Legislative Challenge: The Constitution of India confers powers to the Union and the States to levy and collect taxes as per the three lists, i.e., Union, State and Concurrent List. The challenge before the FM in implementing GST is whether this distribution of powers among the Union and States can be treated as the basic structure of the Constitution thereby restricting the Government from bringing about any change in this structure. The Constitution of India requires amendment to provide for powers to levy and collect GST both by the Union and the States in order to enable the Centre and the State Governments to levy GST. 4. Improvement in Banking System: The destination based principle of taxation under the GST, states that the recipient State will have to levy the tax as per the law of the dispatching State. If there is no uniform law and rates across India, then this principle is bound to create problems. This requires tax collected by the recipient State to be credited to the exporting State. It would be a challenge for the Governments to allocate revenue to the respective States. In Dual GST model the banks can play a role as intermediary in collection and transfer of revenue to the respective States. In case of inter-State transactions the person collecting the tax on his supply should deposit the tax in the account of the State where the supply has been made. The banks can then allocate the revenue to the respective States or the Central Government, as the case may be, on the basis of revenue reports of the respective Governments. For this purpose, the banking system needs to be improved. The challenge can be met by proper training, upgradation of tax administration with technological interface. 5. IT infrastructure: For the smooth implementation of the GST model, IT infrastructure for the Goods and Services would have to be put on fast track. “IT infrastructure will play a huge role in interstate GST. 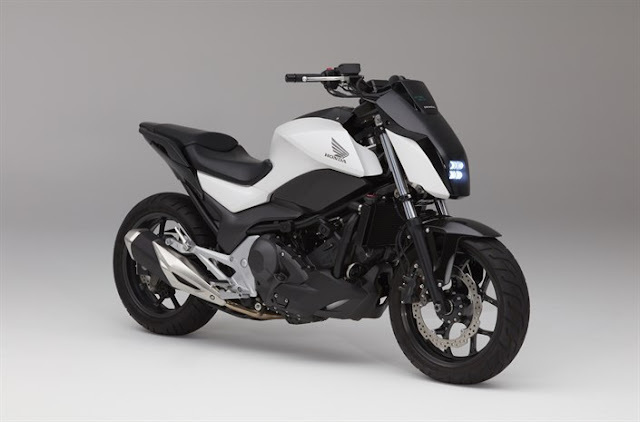 IGST will be collected and passed on the states. It will have to be transferred electronically”, the experts said. 6. Effective Credit Mechanism: The success of dual GST model depends on effective credit mechanism to avoid the cascading effect of multi-stage taxation in the supply chain. The lifeline of GST is the credit mechanism. There is no difficulty in giving credit of Central GST anywhere in India as is evidenced by success of the present CENVAT scheme, as far as Central GST is concerned. But, presently, there are issues related to State GST in giving credit in relation to inter-State transactions. While there is a lot of uncertainty on the implementation of the goods and services tax (GST) in April next year, this new tax structure is expected to bring in better pricing and margins for the automobile industry. The automobile industry is reap rich benefits from the GST, which include reduction in cost for the industry, which is currently marred by endless taxes charged at different state levels. If the opinions and views of the experts are to be believed, the cost savings will run into double-digits for the sector. GST is expected to eradicate small tax windows and lead to seamless travel of products from one state to the other. It would remove multiple taxes and bring forth the right value of the products. The government is also expected to come up with a separate duty structure for small and electric vehicles citing the rising pressure to keep carbon dioxide emissions under check. Further, he said there is no clarity on what happens to the customs duty. The expected GST is around 18% (taking centre and states together). 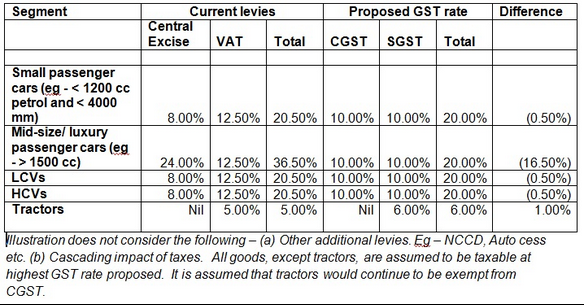 The figure below depicts the positive impact which GST will have on the automobile sector on a statistical basis. There are however few roadblocks which need to be cleared for the implementation of GST such as gaining consensus of the States on aspects like rate classification, threshold limits of rates etc. Furthermore the government will have to ensure that the cascading impact of taxes on business is not present in GST, which is only possible by exclusion of levies such as stamp duty or octroi/ cess from the proposed GST model. There are various aspects which need clarity in order for the auto industry to be better prepared for when the GST is implemented such as continuation of export incentives linked to indirect taxes, end use based exemptions to taxis, ambulances etc. The government will have add more clarity into these aspects of GST as it will help the auto sector companies to make their operational planning accordingly and help in a smooth transition into the GST era. A good article needs great effort. Your article has good information which is very helpful and interesting. Preparing such an amazing post is not easy. I am always reading articles and news to improve my knowledge. I need such great value posts so that I am regularly following your blog. I have to keep all the basic information as I am working with GST Suvidha Provider.